Day Trip Testing Camera – Film at Eleven ! Drove out 70 towards Frederick and snaked down Rt. 15 towards Leesburg. Right before the bridge to Virginia, went into Point of Rocks to test camera. The station is at the point where the CSX line from Western Maryland splits…one side towards Baltimore and the other toward Wasginton, DC. 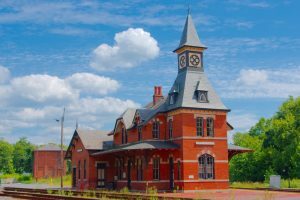 The station was built in 1873 by the B&O Railroad in conjunction with the opening of service to Washington DC. Today, the only passenger service available at Point of Rocks is the MARC commuter trains. The camera I tested was a Pentax K-3 using a 18-55 mm zoom. I used Corel AfterShot to edit the picture. You can click on the image to see a larger version.